rec. St. Nikolaus Dehrn, Germany, 31 March, 3 April, 11-12 August 2016. This disc marks a very auspicious start to what promises to be the “first ever complete recording of these sometimes humorous, sometimes yearning songs”. On this evidence I hope that volume two is not long behind the first. The only songs on this disc that I knew where the Neun Ausgewählte Volkslieder, which I heard in the excellent recording by the Dresdner Kammerchor under Hans-Peter Rademann on Carus 83.231. According to a letter written by Reger all nine were composed in one week during January 1899. The nine folk song arrangements were the first of three collections to be published in that year after he had been recommended to his publisher by Richard Strauss. Reger described them as “simpler yet artistically finer” than his earlier folksong arrangements, They are beautifully arranged and sung. From the opening bar of the first of the songs, Die Erde braucht Regen, with its simple theme of love, you know that this is going to be an important release and so it proves. These tender arrangements fly in the face of the assertion that all Reger’s music gets lost in over-complex counterpoint. These are followed by his Sieben Männerchöre, the only music on this disc with an opus number. They date from later in the same year. 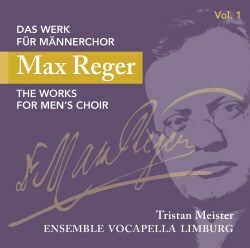 These seven songs once again display the Reger’s prowess as a composer for voice, and especially chorus. They are a bit more complex that the Volkslieder, but still boast a great deal of charm and grace. These are followed by three individual pieces that seem to have been composed during the same period, with Lacrimä Christi being the stand-out for me. With the Fünf Ausgewählte Volkslieder we have arrangements from 1898. Whether these are the arrangements he himself referred to in his letter is unsure. Some of them have a more condensed vocal texture than the pieces that open the disc, but they are still achingly beautiful. Just listen to the fifth and final song, Ich hab die Nacht geträumet, to appreciate this. Listening to the Sechs Geistliche Lieder nach Gedichten von Eichendorff comes as something of a shock. Here we have Reger arranging Hugo Wolf for chorus. Yes, I know he arranged other composers, the orchestrations of Schubert songs spring to mind, but here we have him in 1903, reducing a score from mixed chorus and orchestra, or piano, to a cappella male chorus. It seems that Reger identified Wolf as a ‘tragically misunderstood genius’. After Wolf's death in 1903 Reger undertook the task of editor of Wolf's works, revising some; this being one of them. I have heard the original - a friend of mine has a Globe recording, but I have only heard it the once and I therefore find it hard to compare. I remember being quite taken with it. Reger’s handling of the arrangement seems sensitive and the result is quite striking. The Ensemble Vocapella Limburg under the expert direction of Tristan Meister, prove to be vocally astute and well balanced. They produce a beautiful sound. The acoustic of the church is quite pleasing also, something that aids the recorded sound. The booklet notes by Dr Alexander Becker from the Max-Reger-Institut are first rate, the only drawback being that whilst full song texts are included, there are no translations. I have had a brief search online but as yet, have not found any translations.